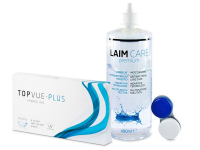 TopVue Monthly Plus are contact lenses with a monthly replacement schedule. They are made from hydrogel material and feature a high water content and UV filters. They are lightly tinted for easier handling and provide all-day comfort. 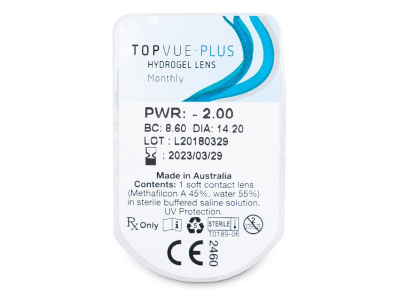 TopVue Monthly Plus are monthly contact lenses made from hydrogel material Methafilcon A, with a high water content and UV filters. The lenses are lightly tinted for easier visibility and handling. 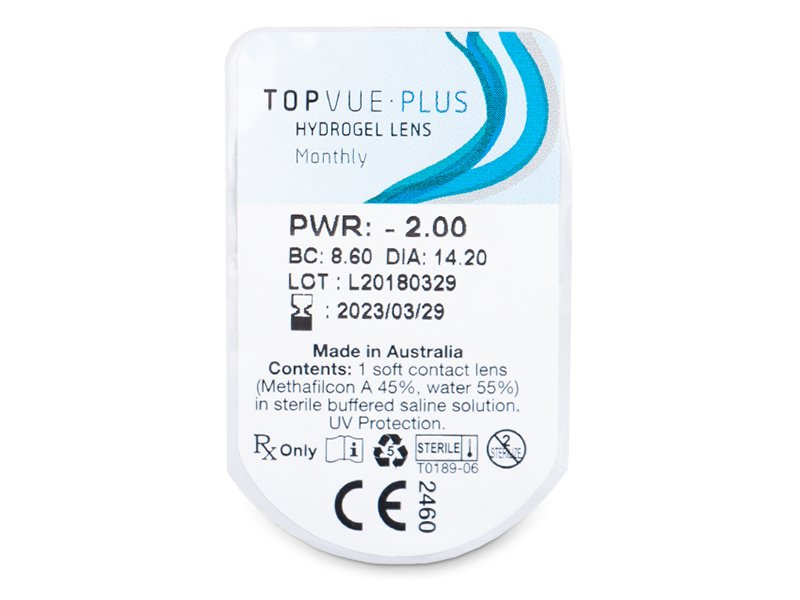 Thanks to their advanced technology, TopVue Monthly Plus lenses are perfectly moisturised and comfortable for all contact lens wearers. This package contains six lenses. TopVue Monthly Plus contact lenses are intended for daily use with a 30-day replacement schedule. At night, it is necessary to remove and store the lenses in a contact lens case filled with solution. The precise design of TopVue Monthly Plus contact lenses provides just the right amount of movement on the eye. The design, together with their high water content (55%), ensures constant lens rehydration, which increases wearing comfort and overall eye health. TopVue Monthly Plus are designed to provide exceptional comfort. Thanks to the unique Radial Edge Technology, which provides uniform edge thickness, comfort is maximised as friction with the eyelid is minimised. TopVue Monthly Plus contact lenses are equipped with UV filters that help absorb UVA and UVB rays. It is still necessary to protect your eyes with sunglasses, as the contact lenses only cover a small part of your eyes. Gave these a try for the first time. Happy with how comfortable they feel and how easy they are to put in. Price is good too which is a bonus. These lenses have been awful, dry my eyes out so within few hours of wear feel like I have film over them and can’t see properly. I thought it might be isolated problem but have tried 2 pairs now and no change. I have used lenses for 20 years and these are the worst! I am going back to biofinity. When they popped up as an alternative I was tempted by price difference but learnt my lesson now, beware you get what you pay for with these lenses. HI, CAN YOU TELL ME WHAT IS THE PERMEABILITY OF TOPVUE PLUS ? Hi Carole, TopVue Monthly Plus oxygen permeability is 27 dk/t. Hi, I have been wearing daily lenses and found them difficult to wear. A friend suggested I might have better luck with monthlies. Basically I am looking for comfortable contact lenses that are easy to handle and won't fall out of my eye. Would you suggest these for someone like me? Hello Margaret, TopVue are a great choice for monthly lenses. 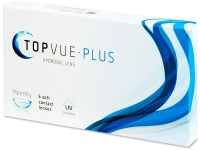 The TopVue Monthly Plus have a high water content (55%) to ensure they remain comfortable throughout the day. They also have a slight contact lens visibility tint to help you handle them with greater ease. Why is a high water content good for contact lenses? Is 55% considered a high content? Hi Scott, high water content in contact lenses helps make the lenses more comfortable. 55% is quite high, as most lenses' water content is between 30 and 60%. More water means the lenses will be comfortable for longer periods of wear. What are the advantages of silicone hydrogel contact lenses? Are they significantly better than lenses with just hydrogel? Hi Sarah, the addition of silicone to traditional hydrogel contact lenses primarily allows for greater oxygen permeability. The lenses can remain comfortable on the eye for longer periods of time, because more oxygen is able to reach the cornea. Very good lenses. I have been wearing the Topview premium, and these are just as comfortable. Highly recommended. Are these a natural replacement for Frequency 55? They are now discontinued and I'm running low! These lenses are very similar to Frequency 55 and we believe they are a suitable substitute. If you need more info about these lenses, please let us know.